Some residents of the central Russian city of Perm have asked the authorities to remove 10 billboards with Stalin’s portraits, put up by the Communist Party, claiming the law only allows the medium to be used for commercial advertising. The billboards, which remain on Perm’s streets, feature the photo of the Soviet dictator together with the famous quote, “Stalin found Russia working with wooden plows and left it equipped with atomic piles,” attributed to Winston Churchill. The Communist Party says on its website that the placement was timed with the 135th anniversary of Stalin’s birth and the 70th anniversary of the Soviet Union’s victory in WWII. The outdoor campaign started two months ago, but the scandal erupted only in mid-February as some unnamed vigilant citizens reported about it to the Federal Anti-Monopoly Service – the state agency that oversees how laws on advertising are observed. The essence of complaints is that billboards can only be used for commercial advertising or promotion of charity projects, while the sites in question do not fall under either category. Officials told local mass media that they were now trying to establish who ordered the campaign in order to tell them to stop it. 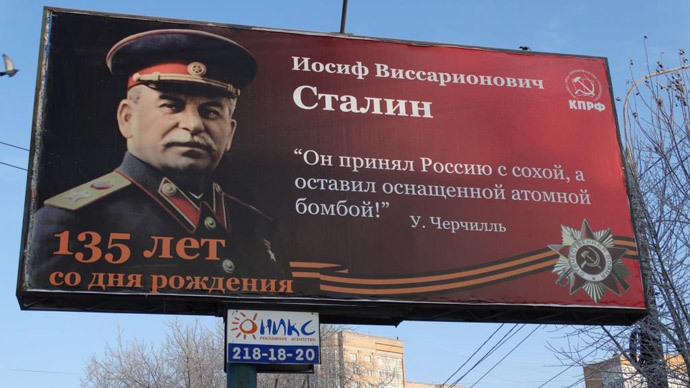 The Perm branch of the Communist Party replied with an emotional statement, accusing their opponents of hypocrisy and noting that all information about the sponsors of the campaign can be found on the billboards themselves, in the regional Communist newspaper and on the party’s website. A similar situation took place in the southern Russian city of Voronezh in 2008. Local mayor ordered the removal of 10 billboards with Stalin’s portraits for the same reason just three days after they were put up. Local communists complained to the prosecutor’s office and claimed that the law enforcers had taken their side, but removed the ads anyway, saying that the campaign had already ended, as planned.